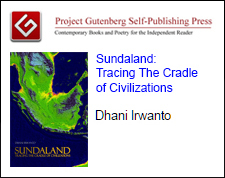 This book presents abundance of indications from archaeological data, genetic studies, legends, myths and tales that Sundaland, a bio-geographical region of Southeastern Asia that was exposed during the Last Glacial period, is the cradle of human civilizations. 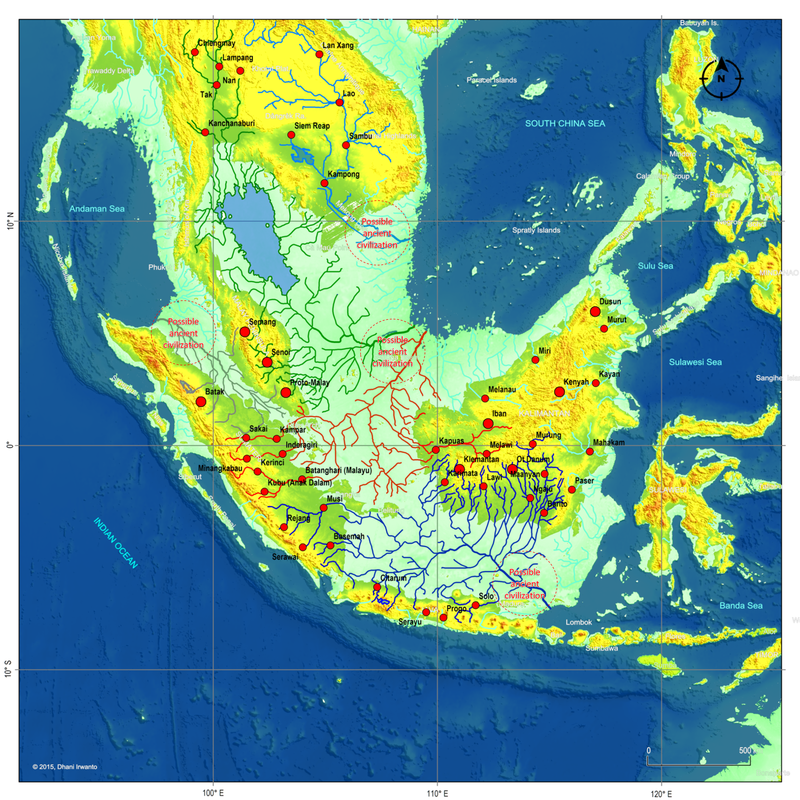 Sundaland is a bio-geographical region of Southeastern Asia which encompasses the Sunda shelf, the part of the Asian continental shelf that was exposed during the last Ice Age. The last glacial period, popularly known as the Ice Age, was the most recent glacial period within the current Ice Age occurring during the last years of the Pleistocene, from approximately 110,000 to 12,000 years ago. 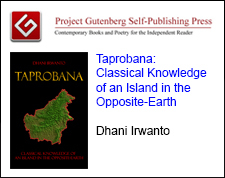 It included the Malay Peninsula on the Asian mainland, as well as the large islands of Kalimantan, Java, and Sumatera and their surrounding islands. 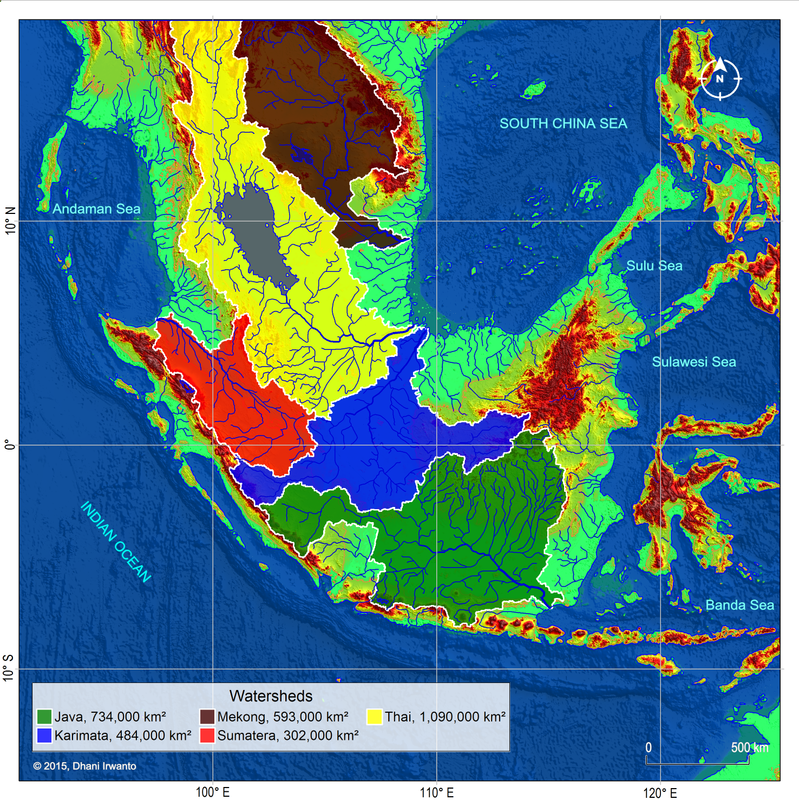 The eastern boundary of Sundaland is the Wallace Line, identified by Alfred Russel Wallace as the eastern boundary of the range of Asia’s land mammal fauna, and thus the boundary of the Indomalaya and Australasia ecozones. The islands east of the Wallace line are known as Wallacea, and are considered part of Australasia. It is worth noting that it is now generally accepted that South East Asia was probably the entry point of modern humans from Africa. 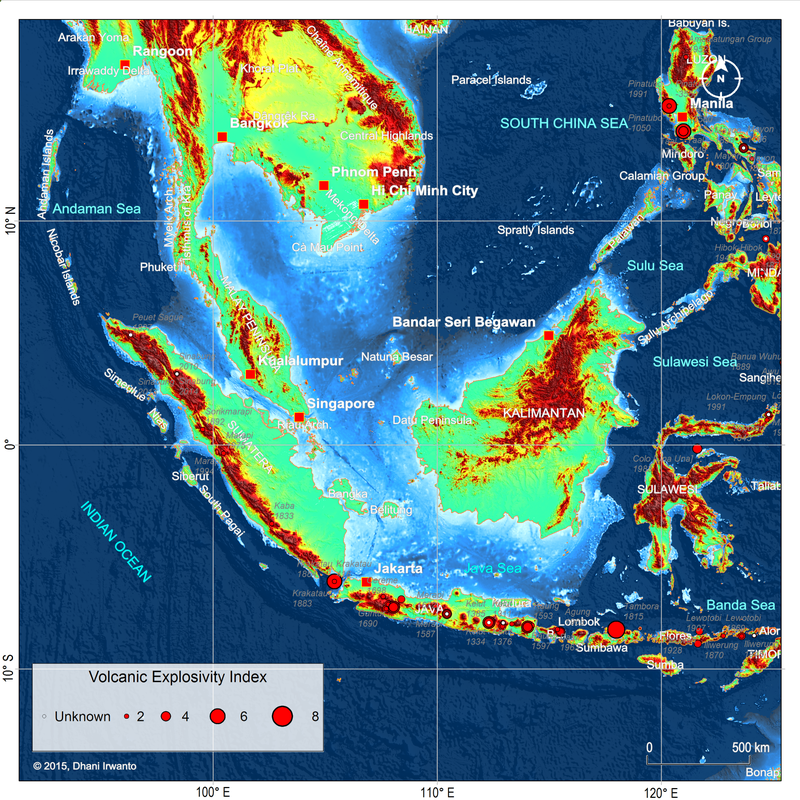 The name “Sundaland” was first proposed by van Bemmelen in 1949, followed by Katili (1975), Hamilton (1979) and Hutchison (1989), to describe the continental core of Southeast Asia forming the southern part of the Eurasian plate. Sundaland is bordered to the west, south and east by tectonically active region characterized by intense seismicity and volcanic activity. The tectonically active zone is effectively a mountain belt in the process of formation, and contain many of the features typically thought to be associated with accretionary orogens: there is active subduction, transfer of material at plate boundaries, examples of collision with buoyant feature on oceanic plates, arcs and continents, and abundant magmatism. 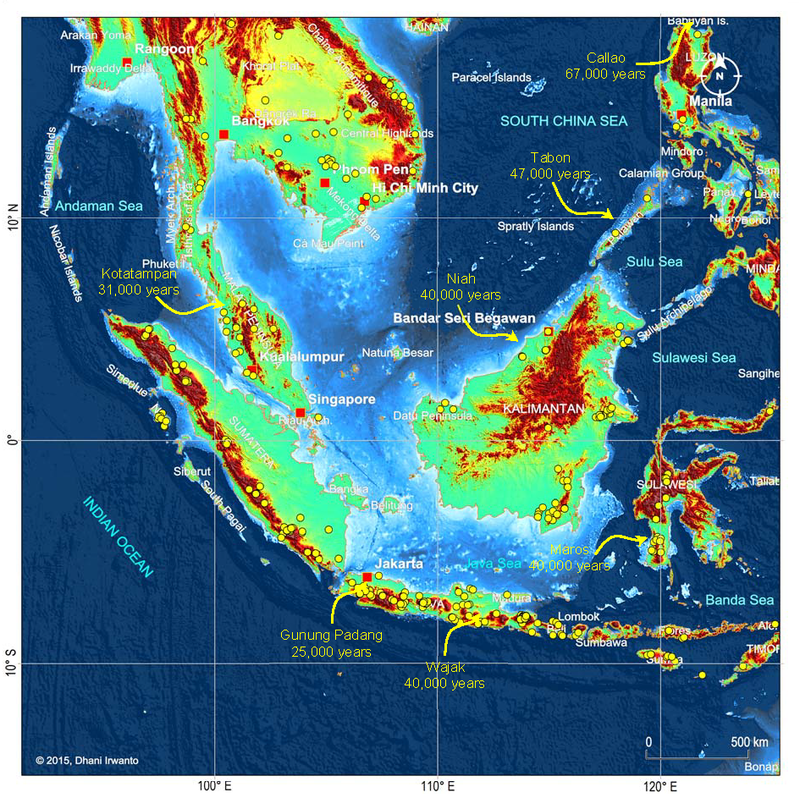 The present orogenic belt is situated at the junction of three major plates: the Eurasian, Indian, Australian and Pacific-Philippine Sea plates. It surrounds Sundaland and stretches from Sumatera to The Philippines via eastern Indonesia. It changes character and width from west to east and is composed of different segments or sutures with different character. The South China Sea and adjoining landmasses had been investigated by scientists such as Molengraaff and Umbgrove, who had postulated ancient, now submerged drainage systems. These were mapped by Tjia in 1980 and described in greater detail by Emmel and Curray in 1982 complete with river deltas, floodplains and back swamps. The ecology of the exposed Sunda Shelf has been investigated by analyzing cores drilled into the ocean bed. The pollens found in the cores have revealed a complex ecosystem that changed over time. The flooding of Sundaland separated species that had once shared the same environment such as the river threadfin (Polydactylus macrophthalmus, Bleeker 1858; Polynemus borneensis, Vaillant 1893) that had once thrived in a river system now called “North Sunda River” or “Molengraaff River”. The fish is now found in the Kapuas River on the island of Kalimantan, and in the Musi and Batanghari rivers in Sumatera. The last glacial period, popularly known as the Ice Age, was the most recent glacial period within the current ice age occurring during the last years of the Pleistocene, from approximately 110,000 to 11,600 years BP. The most extensive glaciation in the last glacial period was about 21,000 years ago. Scientists consider this Ice Age to be merely the latest glaciation event in a much larger ice age, one that dates back over two million years and has seen multiple glaciations. During this period, there were several changes between glacier advance and retreat. The maximum extent of glaciation within this last glacial period was approximately 22,000 years BP. While the general pattern of global cooling and glacier advance was similar, local differences in the development of glacier advance and retreat makes it difficult to compare the details from continent to continent. From the point of view of human archaeology, it falls in the Paleolithic and Mesolithic periods. When the glaciation event started, Homo sapiens were confined to Africa and used tools comparable to those used by Neanderthals in Europe and the Levant and by Homo erectus in Asia. Near the end of the event, Homo sapiens spread into Europe, Asia, and Australia. The retreat of the glaciers allowed groups of Asians to migrate to the Americas and populate them. The Younger Dryas stadial, also referred to as the Big Freeze, was a geologically brief (1,300 ± 70 years) period of cold climatic conditions and drought which occurred between approximately 12,800 and 11,600 years BP. The Younger Dryas stadial is thought to have been caused by the collapse of the North American ice sheets, although rival theories have been proposed. It followed the Bølling-Allerød interstadial (warm period) at the end of the Pleistocene and preceded the preboreal of the early Holocene. It is named after an indicator genus, the alpine-tundra wildflower Dryas Octopetala. The Dryas stadials were cold periods which interrupted the warming trend since the Last Glacial Maximum 21,000 years BP. The Older Dryas occurred approximately 1,000 years before the Younger Dryas and lasted about 400 years. The Oldest Dryas is dated between approximately 18,000 and 14,700 BP. Figure 5 – A map showing the Sundaland around the Last Glacial period (21,000 years BP) generated by the author from the GTOPO30 elevation grids published by USGS. The sea water level was around 120 meter below the present-day sea water level. The flow pattern of the rivers below the present-day sea water level is generated using the same grids and approximations of sea sedimentation, littoral drift, delta formation, meandering, river regime change and river bed movement. The present-day inland rivers are combined. The colors other than blue represent the ground levels. The thin red lines are the present-day shorelines. Present-day topographic and bathymetric data covering the Sunda Shelf in geographic projection (latitude and longitude) are extracted from the GTOPO30 elevation grids published by USGS. GTOPO30 refers to 30-arc second (approximately 0.9 km near equator) horizontal latitude and longitude spatial resolution of digital elevation model (DEM) file format. Other similar grids like GEBCO_8 published by IHO and IOC/UNESCO, and ETOPO1 published by NOAA are also used as references. A color scheme is applied to the DEM in which areas below -120 m are represented by blue colors so that the Last Glacial Maximum coastlines can be easily identified. Several assumptions are made in the analytical procedures (Sathiamurthy et al, 2006). First, it is assumed that the current topography and bathymetry of the region approximate the physiography that existed during the span of time from 21,000 years BP to present. However, because sedimentation and scouring processes have affected the bathymetry of the Sunda Shelf over the last 21,000 years (Schimanski and Stattegger, 2005), we know that this is only an approximation. 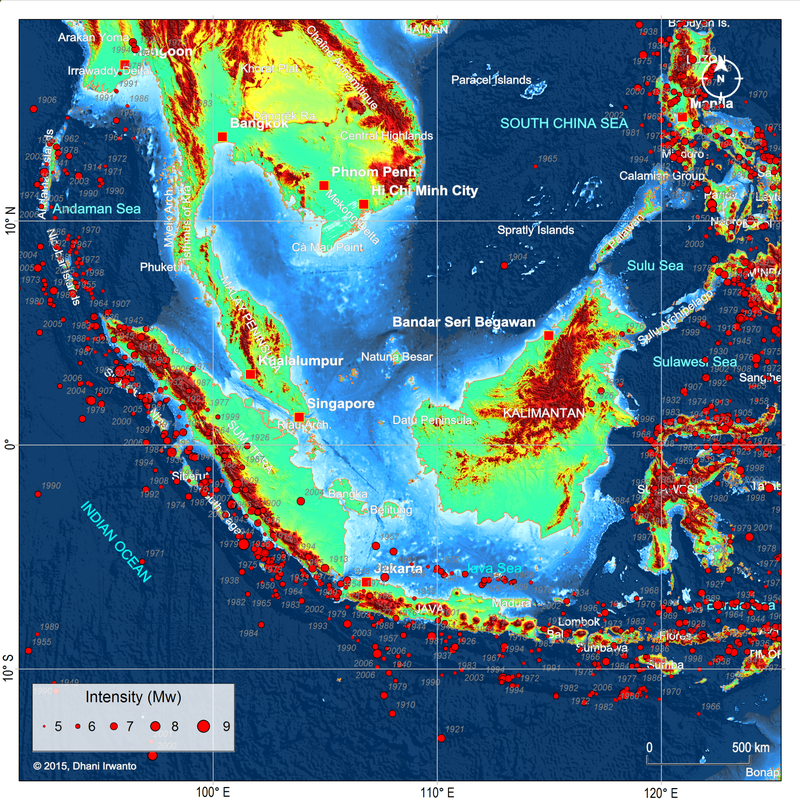 Thus, it should be emphasized that the depth and geometry of the Sunda Shelf and the existing present-day submerged depressions do not reflect past conditions precisely. Second, it is assumed that the present-day sea bed are likely to have existed during the Last Glacial Maximum and have not resulted from seabed scouring by currents, limestone solution, or tectonic movement-possibilities that were pointed out by Umbgrove (1949) as perhaps taking place during early post-Pleistocene transgression. In the case of tectonic movement, Geyh et al (1979) mentioned that the Sumatera Strait was tectonically stable at least during the Holocene. Furthermore, Tjia et al (1983), state that the Sunda Shelf has been largely tectonically stable since the beginning of the Tertiary. 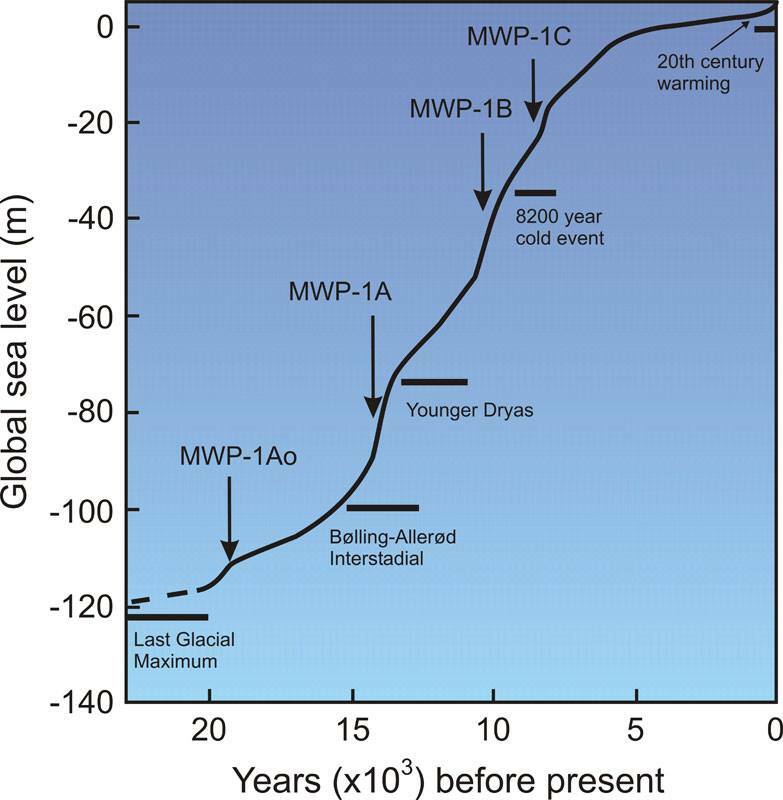 Nevertheless, Tjia et al (1983) indicated that sea level rise in this region may be attributed to a combination of actual sea level rise and vertical crust movement. Hill (1968) in reference to earlier work done by Umbgrove (1949), suggested the possibility of limestone solution as a mode of depression formation (as in the case of the Lumut pit off the coast of Perak, Malaysia), and gave an alternative explanation, which was of tectonic origin. Sea bed sedimentation data are rarely available but approximation of sedimentation process is made in generating the topographic and bathymetric regional map of Sundaland. In similar conditions, other processes like littoral drift, delta formation, meandering, river regime change and river bed movement are also approximated and incorporated on the maps. Ancient lakes are reconstructed from the DEM and any geological history that exist. Small and insignificant islands are removed. Along with the topographic and bathymetric map, shorelines at certain sea water levels, ground surface slope, river watersheds and flow pattern of rivers are also generated and place them in different layers. Figure 6 – A map showing the Sundaland major watersheds around the Last Glacial Maximum period (21,000 years BP) generated by the author using the same method as in the previous figures. River names are given referring to the sea, strait, gulf, island or present day river names occupied by the watersheds. 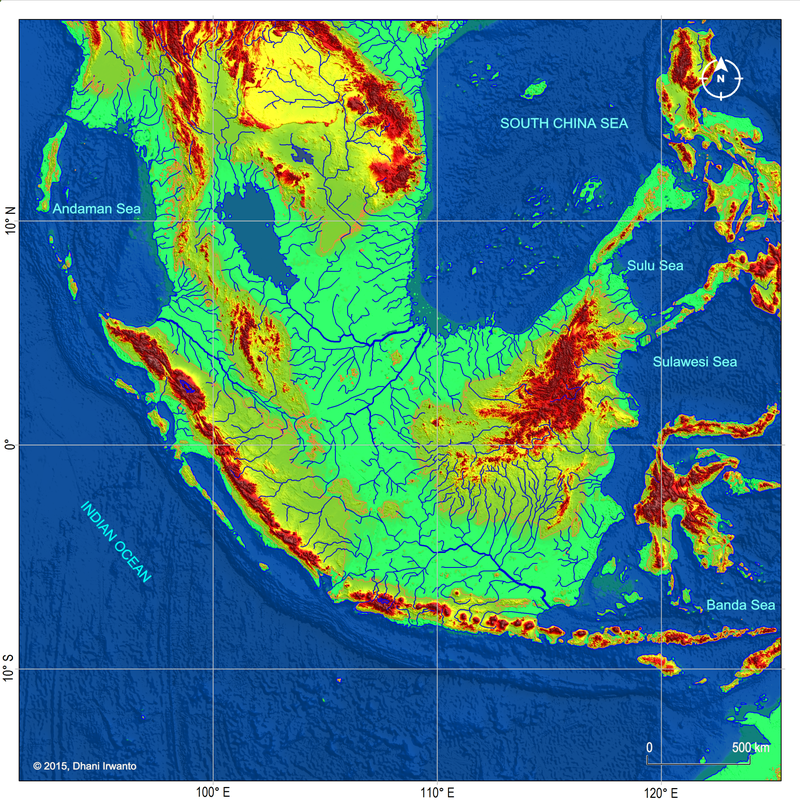 Cannon et al (2009) have done research on the distribution of vegetation in Sundaland during the Last Glacial Maximum using explicit spatial model coupled with the evidence of geography, paleoclimatology and geology. The vegetation is divided into three types, namely coastal/swamp, lowland and highland evergreen rainforests. Coastal/swamp evergreen rainforests experienced the most dynamic biogeographic history of the 3 forest types examined. At the peak of the Last Glacial Maximum, when sea levels fell below the shelf margin, mangroves were restricted to a very narrow belt along coastlines. However, many coastal swamp taxa would have maintained widespread inland distributions on poorly drained interfluves on watershed or kerapah peats, and in kerangas vegetation, which share many taxa with coastal peat swamp forests. As the shelf began to flood, especially from 11,000 to 9,000 BP, the coastal/swamp evergreen rainforests would have experienced a dramatic but relatively brief expansion. Since about 8,000 BP, coastal forests have roughly remained in their present positions, with the extent of mangroves, freshwater alluvial and peatswamps being determined by the patterns of progradation of individual river deltas following the Holocene transgression. The coastal/swamp evergreen rainforests also experienced a sudden and complete geographic relocation over hundreds of kilometers during the flooding, as the coastline retreated quickly across the shelf, coupled with an equally dramatic change in core area from minimal at the Last Glacial Maximum to maximal at the time of the flooding of Sundaland. The total area and core area of the lowland evergreen rainforests were substantially greater than current conditions through the vast majority of the last glacial cycle, with the presence of an open corridor of seasonal forest having relatively little impact. The total area and core area of the highland evergreen rainforests experienced a gradual upward trend through the last glacial cycle, with a fairly dramatic peak at the Last Glacial Maximum. In general, the distribution of the highland evergreen rainforests was very sensitive to the interaction between temperature change and vegetation lapse rate. Figure 8 – Main active faults in Sundaland at the zone of convergence of the plates of Sunda, Eurasia, Philippines, India and Australia. Smaller plates of Timor and Banda Sea (part of Sunda), Maluku (part of Philippines) and Andaman (part of Eurasia) are also shown. Large arrows represent absolute motions of plates. Red triangles are the volcanoes. According to the previous theory, the ancestors of the modern day Austronesian populations of the Malay archipelago and adjacent regions are believed to have migrated southward, from the East Asia mainland to Taiwan, and then to the rest of Maritime Southeast Asia. 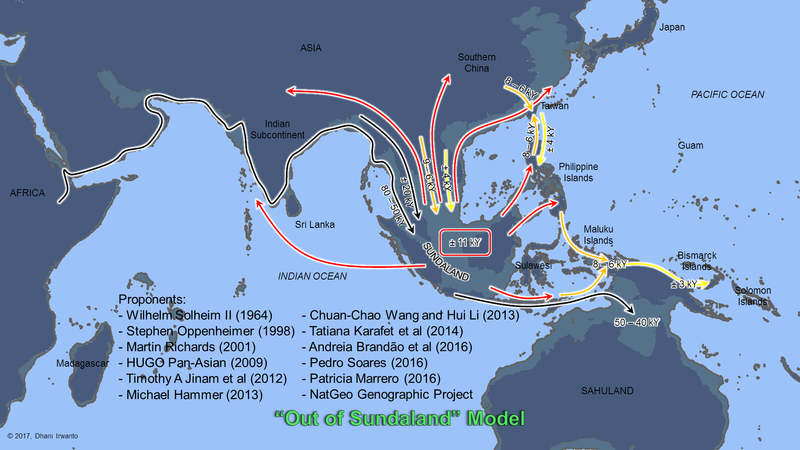 However, recent finding points to the now-submerged Sundaland as the possible cradle of Asian population: thus the “Out of Sundaland” theory. Oppenheimer locates the origin of the Austronesians in Sundaland and its upper regions. Genetic research reported in 2008 indicates that the islands which are the remnants of Sundaland were likely populated as early as 50,000 years ago, contrary to a previous hypothesis (Bellwood and Dizon, 2005) that they were populated as late as 10,000 years ago from Taiwan. A study from Leeds University and published in Molecular Biology and Evolution in 2008, examining mitochondrial DNA lineages, suggested that humans had been occupying the islands of Southeast Asia for a longer period than previously believed. Population dispersals seem to have occurred at the same time as sea levels rose, which may have resulted in migrations from the Philippine Islands to as far north as Taiwan within the last 10,000 years. The population migrations were most likely to have been driven by climate change – the effects of the drowning of an ancient continent. Rising sea levels in three massive pulses may have caused flooding and the submerging of the Sunda continent, creating the Java and South China Seas and the thousands of islands that make up Indonesia and the Philippines today. The changing sea levels would have caused these humans to move away from their coastal homes and culture, and farther inland throughout Southeast Asia. This forced migration would have caused these humans to adapt to the new forest and mountainous environments, developing farms and domestication, and becoming the predecessors to future human populations in these regions. The 2009 research and study by the HUGO Pan-Asian SNP Consortium, conducted within and between the different populations in the Asia continent, showed that genetic ancestry was highly correlated with ethnic and linguistic groups. There was a clear increase in genetic diversity from northern to southern latitudes. The study also suggested that there was one major inflow of human migration into Asia arising from Southeast Asia, rather than multiple inflows from both southern and northern routes as proposed before. This indicates that Southeast Asia was the major geographic source of East Asian and North Asian populations. East Asians have mainly originated from South East Asian populations with minor contributions from Central-South Asian groups. The Taiwan aborigines are derived from Austronesian populations. This stands in contrast to the suggestion that this island served as the ancestral “homeland” for Austronesian speaking populations throughout the Indo-Pacific. In 2012, Stephen Oppenheimer pointed out that the genetic, climatic and archaeological evidence logically suggests a single southern exit of modern human from Africa to Sundaland. All non-African groups today are descended from this exit, with the exception of some autosomes (7% or less) apparently derived from admixture with several archaic non-African groups. Whether this exit predated the Toba eruption is currently unclear. A series of founding bottlenecks characterized rapid migration around the Indian Ocean coast to Borneo and Bali at the tip of the Sunda shelf. Then, a sea-level low stand permitted multiple colonizations of the Sahul, followed by prolonged isolation until the post-glacial period, during which maritime gene flow from island southeast Asia recommenced. These last migrations were limited into Australia and substantial into Melanesia. Climate and access to fresh water were crucial determinants of routes and dates for windows of opportunity. Watch the Jurney of Mankind by The Bradshaw Foundation. In 2012, Jinam et al determined 86 mitochondrial DNA (mtDNA) complete genome sequences in four indigenous Malaysian populations, together with a reanalysis of published autosomal single-nucleotide polymorphism (SNP) data of Southeast Asians to test the plausibility and impact of those migration models. 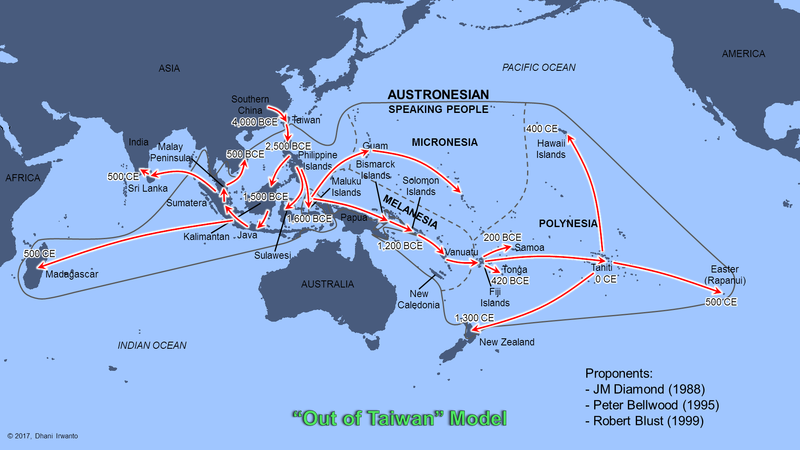 The three Austronesian groups (Bidayuh, Selatar, and Temuan) showed high frequencies of mtDNA haplogroups, which originated from the Asian mainland 30,000–10,000 BP, but low frequencies of “Out of Taiwan” markers. Principal component analysis and phylogenetic analysis using autosomal SNP data indicate a dichotomy between continental and island Austronesian groups. They argue that both the mtDNA and autosomal data suggest an “Early Train” migration originating from Indochina or South China around the late-Pleistocene to early-Holocene period, which predates, but may not necessarily exclude, the Austronesian expansion. 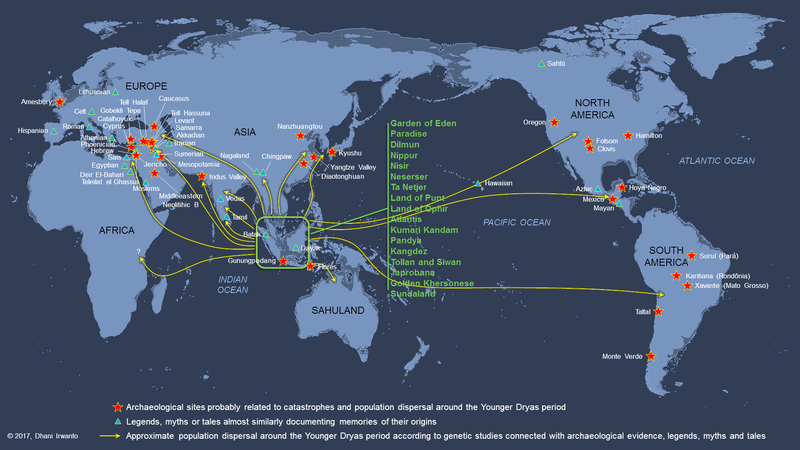 Karafet et al (2014), through a study of Y-DNA supported the hypothesis of a Southeast Asian/Oceanian center for the diversification of Oceanian K-haplogroup lineages and underscore the potential importance of Southeast Asia as a source of genetic variation for Eurasian populations. The phylogenetic structure of haplogroup K-M526 shows consecutive branching events (M526, P331 and P295), which appear to have rapidly diversified. With the exception of P-P27, all of the descendant lineages are located today in Southeast Asia and Oceania: K-M526*, K-P402, K-P261 and NO are the lineages most closely related to haplogroup K-P331, K-P397 is the sister lineage of P-P295 and the P-P295* lineages are the closest relatives of haplogroup P-P27. This pattern leads to hypothesize a southeastern Asian origin for P-P295 and a later expansion of the ancestor of subhaplogroups R and Q into mainland Asia. Although K-M526 was previously characterized by a single polytomy of eight major branches, the phylogenetic structure of haplogroup K-M526 is now resolved into four major subclades (K2a–d). The largest of these subclades, K2b, is divided into two clusters: K2b1 and K2b2. K2b1 combines the previously known haplogroups M, S, K-P60 and K-P79, whereas K2b2 comprises haplogroups P and its subhaplogroups Q and R.
Interestingly, the monophyletic group formed by haplogroups R and Q, which make up the majority of paternal lineages in Europe, Central Asia and the Americas, represents the only subclade with K2b that is not geographically restricted to Southeast Asia and Oceania. Estimates of the interval times for the branching events between M9 and P295 point to an initial rapid diversification process of K-M526 that likely occurred in Southeast Asia, with subsequent westward expansions of the ancestors of haplogroups R and Q. More interestingly, ancient DNA evidence suggests that haplogroup R1b – the current dominant lineage in western Europe – did not reach high frequencies until after the European Neolithic period as given in Lacan et al and Pinhasi et al. There has been a long-standing debate concerning the extent to which the spread of Neolithic ceramics and Malay-Polynesian languages in Island Southeast Asia (ISEA) were coupled to an agriculturally driven demic dispersal out of Taiwan 4,000 years ago. Brandão et al in a paper published by the Human Genetics in 2016 addressed this question using founder analysis of mitochondrial DNA (mtDNA) control-region sequences to identify major lineage clusters most likely to have dispersed from Taiwan into ISEA, proposing that the dispersal had a relatively minor impact on the extant genetic structure of ISEA, and that the role of agriculture in the expansion of the Austronesian languages was therefore likely to have been correspondingly minor. They showed that, in total, about 20% of mtDNA lineages in the modern ISEA pool result from the “Out-of-Taiwan” dispersal, with most of the remainder signifying earlier processes, mainly due to sea-level rises after the Last Glacial Maximum. Every one of these founder clusters previously entered Taiwan from China, 6,000 – 7,000 years ago, where rice farming originated, and remained distinct from the indigenous Taiwanese population until after the subsequent dispersal into ISEA. In 2016, Soares et al from the University of Minho in Portugal as published in the Human Genetics showed a series of much more complicated events. mtDNA and Y-chromosome found in the Pacific Islands have existed in the islands of Southeast Asia much earlier than 4,000 BC, which raises serious doubt on the theory of “Out-of-Taiwan”. They argue that the landscape and the changing sea level about 11,500 years ago led to a significant expansion from Indonesia 8,000 years ago. This expansion, which is the team’s discovery, showed that the population in the whole of Southeast Asia and the Pacific Islands share the same mtDNA and Y-chromosome. The results of the study by the team also showed minor wave of migration that may lead to the spread of Austronesian languages. Figure 18 – A map showing the locations of pre-historic remains, which may consist of human skeleton, potteries, metal works, cave painting, burial sites, stone tools, megalithic stones and step pyramids. Note that the remains are densely found in Java, Bali, southern Sumatera, southern Sulawesi and southern Kalimantan. No undersea remain has been investigated. A mass dispersal from Sundaland was happened around the Younger Dryas period (approximately 12,800 – 11,600 years ago), most probably the end of the period. It was caused by an unknown mega catastrophe as detected from the observation data, a sharp decline of the world population, emergence of many civilizations and the people memories (legends, myths, tales) around the world. The dispersal is also detected by the genetic studies. Ideal climatic conditions and natural resources for development were found in Sundaland. After migrating from the semi-deserted savannas of Africa, man first found a place where food was abundant and it was there that they invented farming, agriculture, trading and civilization, which made humanity first flourished. All this took place during the Last Glacial period, where the sea level was as low as 120 meters (400 feet) below the present value that caused a vast land of Sundaland to expose. The glaciers started to retreat and the sea levels continued to rise gradually from the peak levels around 19,000 to about 5,500 years ago. Cracks in the earth’s crust as the weight of the ice shifted to the seas set off catastrophic events. 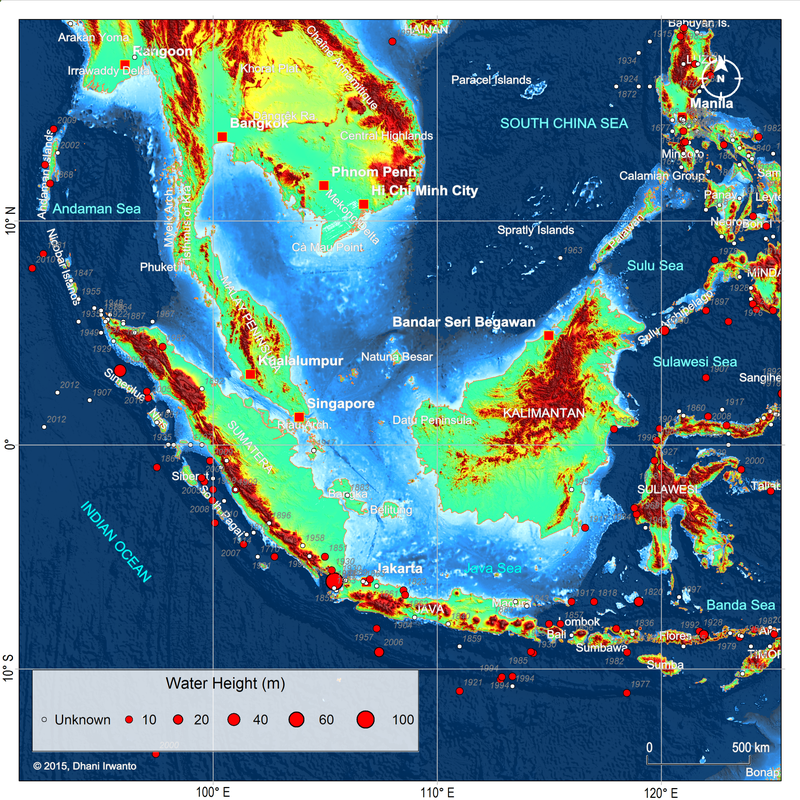 Rapid coastal population loss was compounded by super tsunami waves and super quakes on tropical coasts with flat continental shelves of Southeast Asia. The floods drowned the coastal cultures and all the flat continental shelves, and wiped out many populations. As the sea rolled in, there was a mass migration from the sinking continent at the end of the Younger Dryas period (approximately 11,600 years ago), one of the most well-known examples of such abrupt change. Recent genetic studies show that there has been a sharp decline in the population of the world beginning in the early Holocene, or the end of the Younger Dryas period, causing a bottle neck of human population. There were population turnovers from Southeast, East and South Asia to Europe, Near East and the Caucasus, suggesting that the end of the Younger Dryas period caused the refugium of those populations to migrate and establish new civilizations. From the archaeological data, the end of Younger Dryas was also marked by the emergence of many civilizations around the world. The Younger Dryas disasters are also documented as legends, myths or tales in almost every region on Earth, observable with tremendous similarities. They are common across a wide range of cultures, extending back into Bronze Age and Neolithic prehistory. The overwhelming consistency among legends and myths of flood and the repopulation of man from a flood hero similar to the Noah Flood are found in distant parts of the Earth. The myths similar to the Garden of Eden, Paradise or Divine Land echo among the populations around the world. Memories of their origin are documented in their legends, such as the stories of Atlantis, Neserser, Land of Punt, Land of Ophir, Gilgamesh, Kumari Kandam, Kangdez, Tollan and Taprobana. Those indicate that they were derived from a common origin. With a bulk of collected archaeological and genetic studies as well as legends, myths and tales, the author makes an attempt to reassemble the possible connections of the evidence to obtain the pattern of the population dispersal using a “Potsherd Model”, as shown on the figure below. Rivers supplied a continuous if not always dependable flow and supply of water for transportation, farming and human consumption. These rivers along with climate, vegetation, geography, and topography shaped the development of the early riverine civilizations. However, while people of these civilizations were dependent on the rivers, the rivers also inspired new technological, economic, institutional, and organizational innovations and developments. Riverine cultures were the cradle of maritime civilizations which later developed into Austronesian-speaking people. Large rivers with fertile lands existed in Sundaland during the Ice Age. It is logical that the civilizations developing in this region began at these riverines. Since the seas were inseparable from their lives, their development until fully developed must happen at the estuarines. Sea level rise and frequent floods or tsunamis caused some of them to move to higher ground, on mountains. Rivers are the only means of transportation existed at that time, so they moved along the rivers in the upstream direction. Ancient civilizations survive to this day have been observed and it turns out that they are living in regions upstream of major rivers. 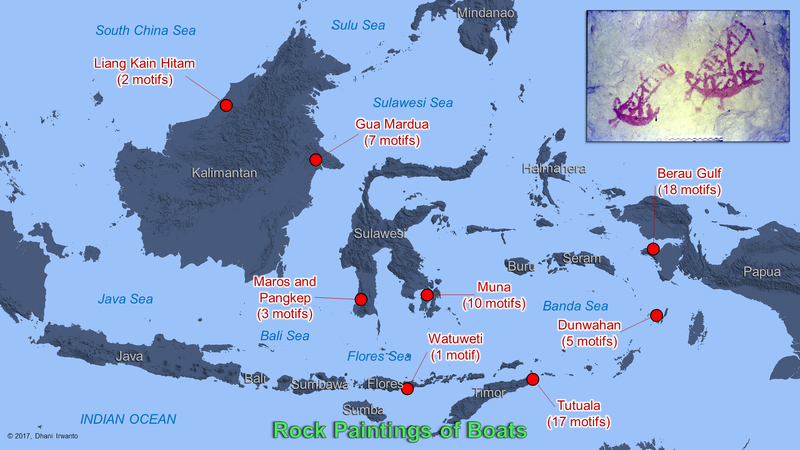 Ancient riverine cultures are evidenced by rock paintings spread allover the archipelago. Most of the paintings are estimated more than 10,000 years old. Some of the paintings depict boats. These suggest that they already had the technology from the very ancient time. The ones in Maros were carbon dated to about 40,000 years old. Recent studies have revealed the presence of several agricultural crops and animals domesticated in Sundaland and its surroundings and they are closely related to population distributions from Sundaland. However, these studies are limited to discoveries available at this time only. The domestications are inseparable from the water environments, either rivers or seas which met at the estuaries. Thus it can be assumed that the early civilizations were centered at the estuarines, as discussed before. However, most Ice Age estuarines in Sundaland are presently under the sea. We can presume that the evidence of the oldest domestications are not discovered due to their locations under the sea and those are discovered today are on higher grounds which are so much younger. Additionally, Sundaland has had frequent volcanic activities resulted in thick layers of volcanic ash, to become serious obstacles to discover such archaeological evidence. In the book Eden in the East (1998), Stephen Oppenheimer claims that the domestication of rice was not in China but in the Malay Peninsula, ca 9,000 years ago. Here grains of rice were found from the eras between 7,000 and 5,000 BC on the Malay Peninsula. This time period is several years older than the arrival of the Austronesian people from Taiwan who were thought to have brought farming technologies to Southeast Asia. There are four main varieties of rice: japonica, a short-grained rice grown in Japan, Korea, and eastern China; indica, a long-grained variety common in India, Pakistan, and most of Southeast Asia; aus, grown primarily in Bangladesh; and aromatic rice, which includes more exotic varieties such as India’s basmati and Thailand’s jasmine. Scientists have primarily focused on indica and japonica because archaeological findings suggest both have a long history of cultivation. Researchers generally agree that humans living in what is now southern China domesticated japonica between 8,200 and 13,500 years ago. The precise locale within southern China is still debated. Experts are still debating the origin of indica. Those claiming one domestication event believe indica emerged from crosses between japonica and wild species as rice cultivation spread through Asia. Those arguing for two separate domestication events generally agree that japonica emerged in southern China, but they contend that indica was independently domesticated in a region straddling India and western Indochina. The new analysis, from a group led by Terence Brown of the University of Manchester in the United Kingdom, adds a third and separate domestication locale, for aus, in a region stretching from central India to Bangladesh. However, research on the origins of rice cultivation is still ongoing. It can be presumed that the evidence of the oldest rice cultivation can not be found because it is located under the sea and the evidence available today are on higher lands which are so much younger. Evidence on the mainland are also not necessarily reflecting the real origins for Sundaland area is generally covered by very thick volcanic ash. Bananas (Musa spp) are believed to have originated more than 10,000 years ago and some scientists believe they may have been the world’s first fruit. The bananas we enjoy today are far better than the original wild fruit which contained many large, hard seeds and not much tasty pulp. There was a cross breeding of two varieties of wild bananas, the Musa acuminata and the Musa baalbisiana. From this process, some bananas became seedless and more like the bananas we eat today. The first bananas are thought to have grown in the region that includes the Malaya Peninsula, Indonesia, the Philippines and New Guinea. From here, traders and travelers took them to India, Africa and Polynesia. There were references to bananas from 600 BC when Buddhist scriptures, known as the Pali Canon, noted Indian traders travelling through the Malaysian region had tasted the fruit and brought plants back with them. In 327 BC, when Alexander The Great and his army invaded India, he discovered banana crop in the Indian Valleys. After tasting this unusual fruit for the first time, he introduced this new discovery to the Western world. By 200 AD bananas had spread to China. According to the Chinese historian Yang Fu, bananas only ever grew in the southern region of China. They were never really popular until the 20th Century as they were considered to be a strange and exotic alien fruit. Bananas began to be developed in Africa about 650 AD. It is thought that traders from Arabia, Persia, India and Indonesia distributed banana suckers around coastal regions of the Indian Ocean (but not Australia) between the 5th and 15th centuries. Portuguese sailors discovered bananas in West Africa and established banana plantations in the 15th century off the coast, in the Canary lslands. Between the 16th and 19th centuries, suckers were traded in the Americas and plantations were established in Latin America and the Caribbean. Banana plants first arrived in Australia in the 1800s. The people of New Guinea were probably the first to domesticate sugarcane (Saccharum spp), sometime around 8,000 BC. However, the extraction and purifying technology techniques were developed by people who were living in India. After domestication, its cultivation spread rapidly to Southeast Asia and southern China. India, where the process of refining cane juice into granulated crystals was developed, was often visited by imperial convoys (such as those from China) to learn about cultivation and sugar refining. By the sixth century AD, sugarcane cultivation and processing had reached Persia; and, from there that knowledge was brought into the Mediterranean by the Arab expansion. Spanish and Portuguese exploration and conquest in the fifteenth century carried sugar south-west of Iberia. Henry the Navigator introduced cane to Madeira in 1425, while the Spanish, having eventually subdued the Canary Islands, introduced sugar cane to them. In 1493, on his second voyage, Christopher Columbus carried sugarcane seedlings to the New World, in particular Hispaniola. The most recent research shows that chili peppers (Capsicum spp) were domesticated more than 6,000 years ago in Mexico, in the region that extends across southern Puebla and northern Oaxaca to southeastern Veracruz, and were one of the first self-pollinating crops cultivated in Mexico, Central and parts of South America. However, chili peppers are mentioned in the Siva Purana and Vamana Purana, from India, dated to the sixth to eighth centuries CE (Banerji 1980). The Sanskrit name marichi-phalam was applied to both Capsicum annuum and Capsicum frutescens (Nadkarni, 1914). The plant and its fruit are naturalistically pictured in stone carvings at a Shiva temple at Tiruchirapalli, Tamil Nadu (Gupta, 1996). A very explicit rendering of chili pepper plants is found on a wall panel of a temple ruin in the garden at the temple at Prambanan, Java. The panel is at least a thousand years old. Research suggest that maize (Zea mays) was first domesticated by indigenous peoples in Mexico about 10,000 years ago. However, field investigations have discovered odd sorts of maize growing in Asia (especially Sikkim Primitive in the remote Himalaya and ‘waxy’ varieties from Myanmar all across China to the Korean peninsula), mostly away from coastal areas where 16th-century Iberian sailors are supposed to have first introduced maize. The characteristics and distribution of these grains cannot be explained in terms of post-Columbian introduction, because waxy varieties were not known in the Americas. Johannessen et al (1998a, 1989a) were the first to document extensively that maize ears were represented in sculptures of ears of corn – hundreds of them – on original temple walls in Karnataka State, southern India. This art usually dates from the 11th to the 13th centuries AD, but some representations are much older. Four Sanskrit words for maize have been recorded, while the Garuda Purana, as well as the Linga Purana texts of the 5th century AD refer to maize. From near Zhenghou, Henan province, China, comes a ceramic effigy of maize, dated about 2,000 BP, that was found in an excavation of an imperial tomb of the Han Dynasty. A bas-relief showing maize is found on a wall panel of a temple ruin in the garden at the temple at Prambanan, Java, next to the panel showing chili pepper plant, at least a thousand years old. The results from the ancient DNA analyses carried by Alice A Storey et al in 2012 of 48 archaeologically derived chicken bones provide support for archaeological hypotheses about the prehistoric human transport of chickens. Haplogroup E mtDNA signatures have been amplified from directly dated samples originating in Europe at 1,000 years ago and in the Pacific at 3,000 years ago indicating multiple prehistoric dispersals from a single Asian center. These two dispersal pathways converged in the Americas where chickens were introduced both by Polynesians and later by Europeans. Research conducted by Martin Johnson at the Department of Physics, Chemistry and Biology of Linköping University, Sweden in 2015 shows chickens were first domesticated from a wild form called red junglefowl (Gallus gallus), a bird that still runs wild in most of Southeast Asia, likely hybridized with the grey junglefowl (Gallus sonneratii). That occurred probably about 8,000 years ago. The research suggests there may have been multiple origins in distinct areas of South and Southeast Asia, including North and South China, Thailand, Burma and India. Research conducted by Matthias Oskarsson at the School of Biotechnology, Royal Institute of Technology (KTH), Sweden in 2012 based on Y-chromosomal DNA sequence suggest that dogs in Asia south of Yangtze River has the highest genetic diversity and was founded from a large number of wolf founders. He emphasized that early dog dispersal is tightly coupled to human history with the dog brought along as a cultural item. He has for the first time investigated the dog dispersal into Polynesia and Australia and their data can be used as evidence for a more complex settlement of Polynesia than earlier indicated from archaeological and linguistic studies. Peter Savolainen of the KTH-Royal Institute of Technology in Sweden and Ya-Ping Zhang of the Kunming Institute of Zoology in China in 2015 simultaneously suggest that humans first domesticated dogs in Southeast Asia 33,000 years ago, and that about 15,000 years ago a subset of dog ancestors began to migrate toward the Middle East and Africa. Their movement was likely inspired by that of their human companions, but it’s also possible that they began their journey independently. One possible motivating factor could have been melting glaciers, which started retreating approximately 19,000 years back. It wasn’t until 5,000 years after they first began spreading out from Southeast Asia that dogs are thought to have reached Europe. Before finally making their way to the Americas, one of these groups doubled-back to Asia where they interbred with dogs that had migrated to northern China. Archaeological evidence indicates that pigs were domesticated at least twice, once in China’s Mekong valley and once in Anatolia, the region in modern-day Turkey between the Black, Mediterranean, and Aegean seas. For another, a 2007 study of genetic material from 323 modern and 221 ancient pigs from western Eurasia suggests that pigs first came to Europe from the Near East, but that Europeans subsequently domesticated local wild boar, which seemed to replace those original pigs. Laurent Frantz, now a bioinformaticist at the University of Oxford in the United Kingdom, carried out sophisticated computer analyses of 103 whole genomes sequenced from wild boars and domesticated pig breeds from all over Europe and Asia, published in Nature Genetics in 2015, indicating that that pigs were indeed originated in those two places. But Europe’s modern pigs are mongrel mixes derived from multiple wild boar populations. Some of their genetic material does not match any wild boar DNA collected by the researchers, so they think that at least some ancestors came from either an extinct group or from another group in central Eurasia. This anomaly suggests that pigs were herded from place to place, where they mated with this “ghost” population. Moreover, at one point – most likely in the 1800s, when Europeans imported Chinese pigs to improve their commercial breeds – a little Asian pig blood entered the mix. The origin of Kalimantan elephants (Elephas maximus borneensis) is controversial. Two competing hypotheses argue that they are either indigenous, tracing back to the Pleistocene, or were introduced, descending from elephants imported in the 16th – 18th centuries. Taxonomically, they have either been classified as a unique subspecies or placed under the Indian or Sumatran subspecies. Prithviraj Fernando et al in 2003 have conducted research comparing DNA of Kalimantan elephants to that of elephants from across the range of the Asian elephant. They find that Kalimantan’s elephants are genetically distinct, with molecular divergence indicative of a Pleistocene colonization of Kalimantan and subsequent isolation about 300,000 years ago. When the sea level rise in the Last Glacial Age separated the Kalimantan Island from the Asian mainland, the elephants were isolated in the island from their cousins on mainland Asia and Sumatera and later evolved to become a distinct Asian elephant sub-species. The now extinct Javan elephants (Elephas maximus sondaicus) those once inhabited Java are identical to the Kalimantan elephants. 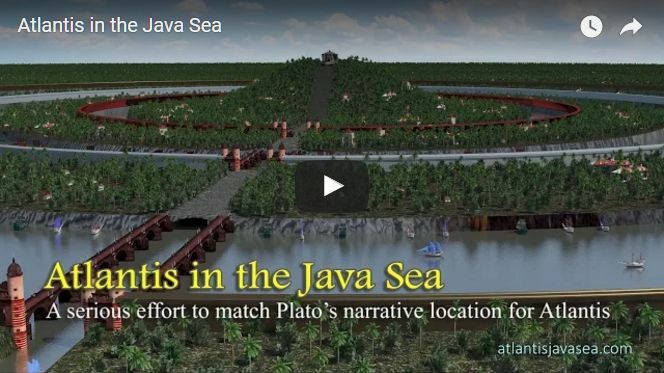 Some authors have specifically claimed a clear link between Sundaland and Plato’s Atlantis. The Sunda Sub-Oceanic Plain is large enough to match Plato’s description of Atlantis. Its topography, climate, flora and fauna together with aspects of local mythologies, all permit a convincing case to be made to support this idea. Thomas Stamford Raffles who was the Lieutenant-Governor of British Java and the founder of Singapore was perhaps the first to suggest a link between Atlantis and Indonesia in his book, The History of Java, published in 1817. A prominent theosophist CW Leadbeater also suggested those link in his book, The Occult History of Java, published in 1951. Other investigators have written on the prehistory of the region of whom the best known is probably Stephen Oppenheimer, in 1998, who firmly locates the Garden of Eden in this region, although he makes little reference to Atlantis. More recently, Robert Schoch, in collaboration with Robert Aquinas McNally, wrote a book in 2003 in which they suggest that pyramid building may have had its origins in a civilization that flourished on parts of Sundaland that are now submerged. 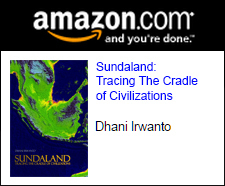 The first book to specifically identify Sundaland with Atlantis was written by Zia Abbas, in his book Atlantis: The Final Solution, published in 2002. 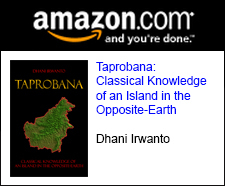 However, prior to its publication the internet offered at least two sites that discussed in detail the case for Atlantis in Southeast Asia. William Lauritzen and the late Professor Arysio Nunes dos Santos developed extensive websites. 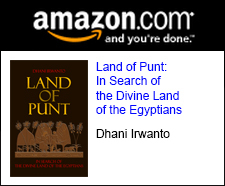 Lauritzen has also written an e-book that is available from his site, while Santos developed his views on a Sundaland Atlantis in another recent book, Atlantis: The Lost Continent Finally Found, published in 2005. Sunil Prasannan has an interesting essay on Graham Hancock’s website. A more esoteric site also offers support for the Sundaland theory of Atlantis. 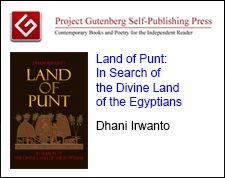 Geologist Danny Hilman Natawidjaja, in his book Plato Never Lied, Atlantis is in Indonesia, published in 2013, written that Gunungpadang was apparently brought by people in pyramid form about 13,000 years ago, the adoption of Atlantis was in the greater of the present-day Indonesia located. Graham Hancock proposed a common origin for various architectural and artistic works in pre-cataclysmic Sundaland as the true location of Atlantis, in his book Magicians of the Gods, published in 2015. 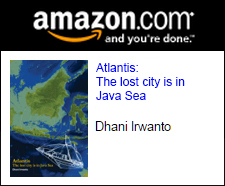 Further support for an Indonesian Atlantis is the publication of a book, Atlantis: The lost city is in Java Sea by Dhani Irwanto in April 2015, who endeavors to identify features of the lost city with details in Plato’s account with a site in the Java Sea off the coast of the island of Kalimantan. The work explains the source of the flood tales of the Middle East and India plus reference to China. It disputes the recently much publicised idea of tsunamis circling the globe caused by comet impact over North America. While this occurred and American legends can be seen as a description of the aftermath of the event, there were no large tsunamis sweeping across the oceans to foreign shores. Recent scientific work has denied that such an impact would create much of a wave, Tsunamis require the movement of the sea floor as a creating force. A second book on the same web page, ‘Measurements of the Gods’ details the development of the measurement systems in place across the ancient world and again, these are traced to Sundaland. In fact much of our modern mathematical learning methodologies can be said to have had an initial development at Sundaland. In this book chapters 17 and 18 reveal how the measures almost certainly were developed at Sundaland. However, the earlier sections of the work demonstrate the existence and relationships of the said measures which can be discovered by anyone with the ability to survey structures accurately or indeed work accurately with maps. Plato made much of the people of Atlantis, they were intelligent civilized folk lost at 9000 years before the time of his narrative. This date agrees with his description that used the term…before the Pillars of Hercules…The Pillars of Hercules to which he refers are associated not with Gibraltar or indeed anywhere else on Earth but with the constellation Hercules. The tale employed astronomy and knowledge of past events on Earth…as do the flood tales of India, The Bible, China and the Middle East generally. To state that Sundaland was the source of the Atlantis tale without explanation of the Pillars of Hercules that stand up to scrutiny is to ignore one of the most important part of Plato’s narrative. The details of the source of the flood stories and Plato’s Atlantis plus evidence leading to Sundaland as the source of much learning is to be found in various sections of both books. There is a bonus…the books and other related papers can be read on the web or downloaded free at the webpage indicated. Comments or queries to h.sivertsen@btinternet.com please.